pretty decent. Also, the glossy screen attracts lots of fingerprints and smudges. The Atom processor does run hotter, requiring netbook-like vents on the sides for cooling. There are three buttons instead of the four that you find on a typical Android device. In this case, the home button operates what would normally be the back button, and the back button acts as the option/menu button. There are no physical volume controls. We aren’t entirely impressed by the build quality. The back panel didn’t fit firmly in place, and the camera isn’t snugly fit in either. It also tends to heat up when charging, and runs hotter while running Windows. 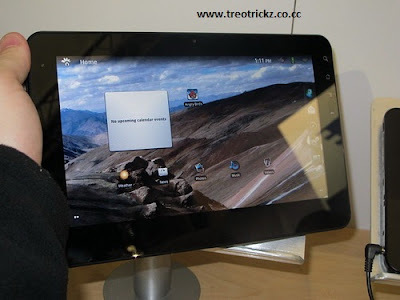 The ViewPad 10 runs the outdated Android 1.6 with very minor customization. 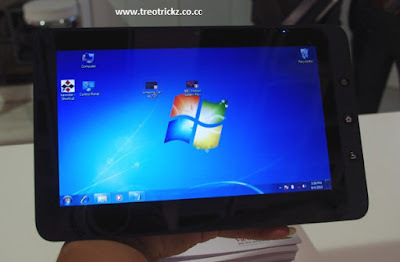 Windows 7 runs fi ne, but the OS isn’t as intuitive as Android. Linpack throws up a score of 15.6 Mfl ops, which makes it at par with the other tablets of its kind. The 10-inch 1024x600 resolution screen is of decent quality, and is excellent for watching movies. The capacitive touchscreen works fine, but holding down to right-click doesn’t always work well. We also faced some problems connecting to a Wi-Fi router over distances that most phones have no issues with. The speakers are decent, and both the quality and power are suffi cient. There is no back facing camera, and the front facing camera’s image quality is average at best. 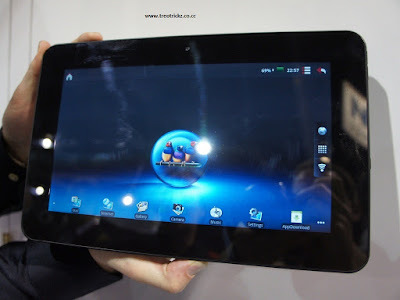 The ViewSonic ViewPad 10 is a decent device, but it requires a lot of tweaking before it can be taken seriously.At the price of 32k,It's pretty expensive.